Using the Metabo long-neck sanders, painters, plasterers and drywall constructors give the right finish to primed surfaces at the wall and ceiling. You can choose between two models - with or without flexible length adjustment. With the drywall sanders you work even in high rooms in a fast and comfortable manner with effective extraction. Both machines allow you to efficiently carry out sanding work without a ladder right to the edge of the wall or ceiling. 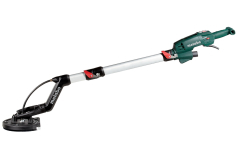 Whilst the LSV 5-225 with a weight of 3.9 kilo is among the lightest machines in its class, the comfort model with a variable length-adjustment offers maximum flexibility: For sanding applications at great height, the 1.60 metres long handle bar can be extended to up to 2.10 metres - the extension piece is available in the accessories section. In narrow rooms you can shorten the machine to 1.10 metres, for easy transport in can be completely disassembled. Thanks to the patented M-Clean technology, extraction in both models is done effectively directly through the machine housing. There are no disturbing hoses at the sanding head, thus making it particularly flexible. This also eliminates maintenance of the hoses. 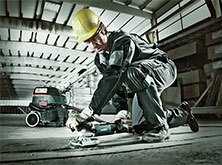 Thanks to its spring-mounted brush rim, the sanding head optimally adapts itself to the surface. 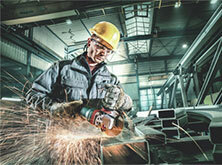 The flexible shafts of the two robust grinding machines can also be replaced, if needed, easily without any tools. The machines come with a replacement shaft, which makes the drywall grinders ready for use at any moment. The LSV 5-225 Comfort is the only long-neck sander on the market with an integrated LED lamp, which illuminates the sanding area even in dark rooms, such as staircases or bathrooms. This helps to quickly detect and process any eventual unevenness. The 500 watt powerful motors are not installed in the head, but in the rear handle area of the machine. Compared to other models on the market, this leads to a significantly improved balance - work is easier and you progress faster. 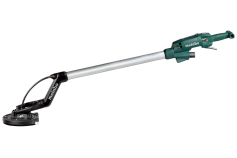 The T-shaped handle fits well in the hand and the machines can be safely put down, without the cable or the hose kinking. Both drywall sanders are part of a complete system solution with which Metabo offers professionals a wide range of sanding media and further accessories such as matching extraction systems - for example the ASR 35 L or M ACP vacuum cleaners.